We are delighted to announce that we have recently partnered with Aya Distribution, an international distributor who specialise in African Cinema. 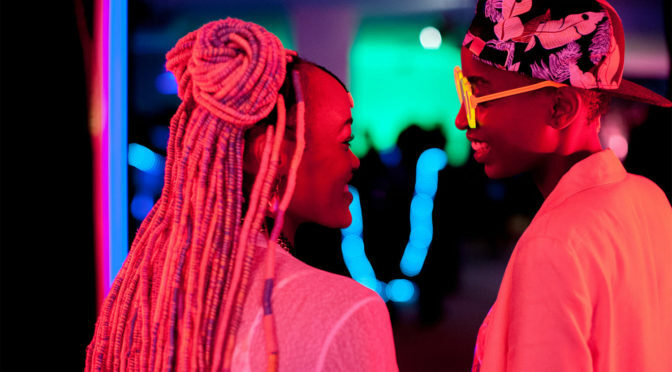 We have just added two of their fantastic titles to our Booking Scheme including incredible Keynan lesbian Romance Rafiki. Currently banned in Kenya because of its LGBTQ themes and its ‘promotion’ of homosexuality, Wanuri Kahiu’s Rafiki follows Kena and Ziki as they have to choose between love and safety. It was the first Kenyan film to be selected to screen at Cannes, where it premiered in Un Certain Regard in 2018. We have also added Beats of Antanov, a documentary telling the story of the Sudanese populations of the Blue Nile and Nuba Mountain regions. All of our films are available to Cinema For All Members now for a flat fee of just £85. To book the films for your community cinema, please fill out the Booking Form on the films’ webpages, or if you have any queries about the films get in touch on info@cinemaforall.org.uk or on 0114 2210314.